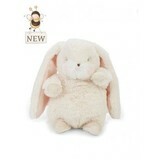 This little bunny is ear-resistible indeed, with super-soft long lop ears, sweet embroidered face and rosy pink cheeks. Eggnog cream and warm white fur, with velour lined ears perfect for personalizing. 8 inches. Surface spot clean.